In the CCBoot main interface "Tools" menu, click "Options". Will pop up "CCBoot Options" dialog box. 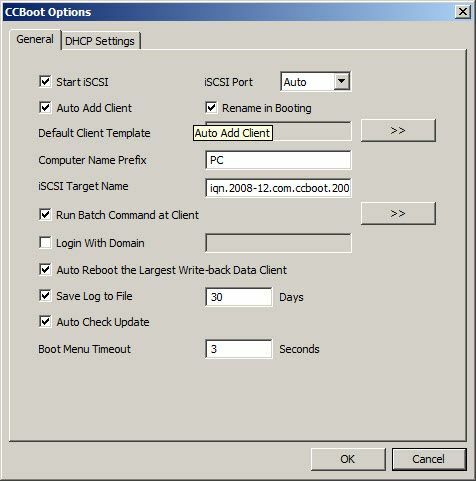 Start iSCSI: ISCSI service is enabled, and whether or not to provide a virtual disk service. iSCSI Port: The iSCSI default ports is port 3260. Auto Add Client: You are allowed to automatically add client. Default User Template: Configure first all the parameters for a client, as a success or to add client default settings. Computer Name Prefix: Set the prefix computer name. iSCSI Target Name: It's iSCSI target name for iSCSI connection. Keep it with default value. There is no need to change. Run Batch Command at Client: Setting up a client operating system startup, programs to run automatically, click on the ">>" button to edit it. Login With Domain: Allow client to Login to domain automatically to specified domain in the box. Auto Reboot the Largest Write-back Data client: Reboots the client with largest writeback data when the writeback disk is about to be full. Save Log to File: If checked, CCBoot stores the log files in the logs folder for specified number of days. Auto Check Update: If checked, checks for new versions available for download from our servers. 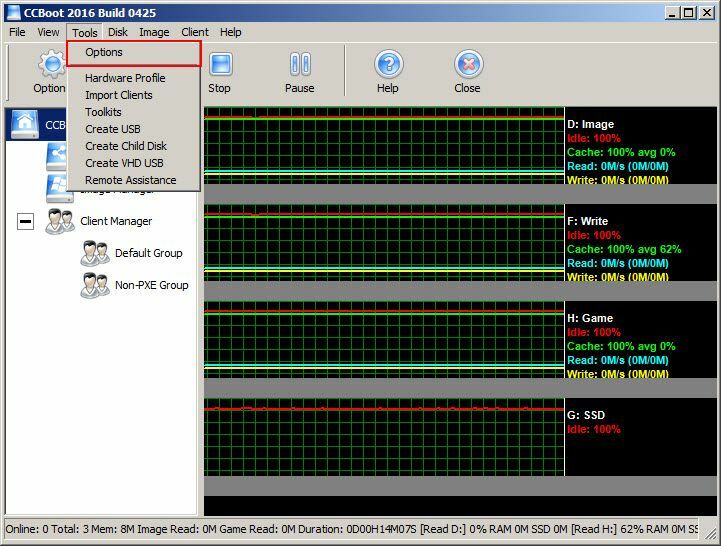 Boot Time Out: The value in seconds for multi boot scenario.